Grigor Dmitrov reacts after beating Belgium's David Goffin in their singles round-robin match during the ATP Tour Finals at the O2 Arena in London on November 15, 2017. The Bulgarian won 6-0, 6-2. 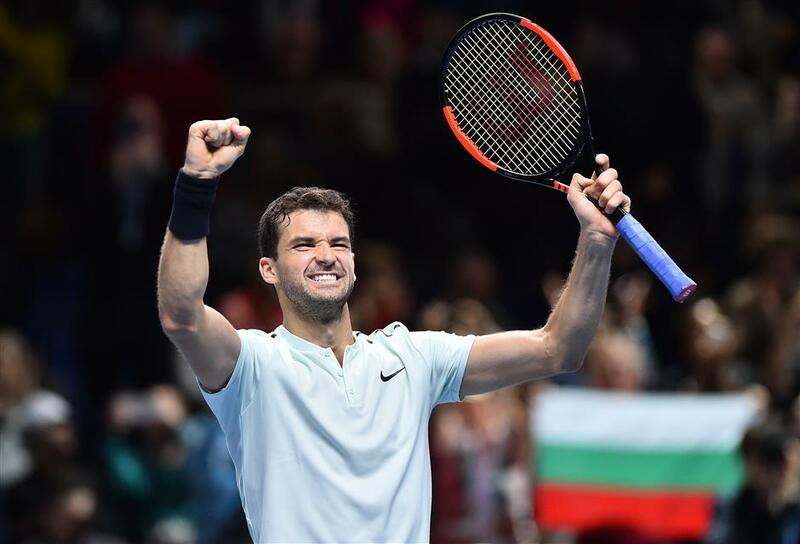 Grigor Dimitrov insists he is no longer playing in Roger Federer's shadow after the Bulgarian capped the best year of his checkered career by reaching the last four at the ATP Tour Finals. When Dimitrov first burst onto the scene by winning the junior Wimbledon title in 2008, his immaculate one-handed backhand and flamboyant stroke-play earned instant comparisons with Swiss great Federer. He has enjoyed victories over Dominic Thiem and David Goffin, the Belgian crushed 6-0, 6-2 on Wednesday, to book his place in the semifinals at London's O2 Arena. Asked if he felt free of the Federer comparisons at last, Dimitrov said: "I think the comparisons and all this, they don't really matter any more. Even when he beat defending champion Andy Murray en route to his first Grand Slam semifinal at Wimbledon in 2014, Dimitrov couldn't summon up the consistency needed to sustain his place at the highest level. He failed to make the quarterfinals of any of the next nine majors and entered 2017 at a career crossroads. But the 26-year-old has been revitalized under the guidance of coach Dani Vallverdu, who had previously worked with former world No. 1 Murray. He ended a 2-1/2-year title drought by winning tournaments in Brisbane, Sofia and Cincinnati, the latter in a Masters 1000 event that ranks as the biggest prize of his career.